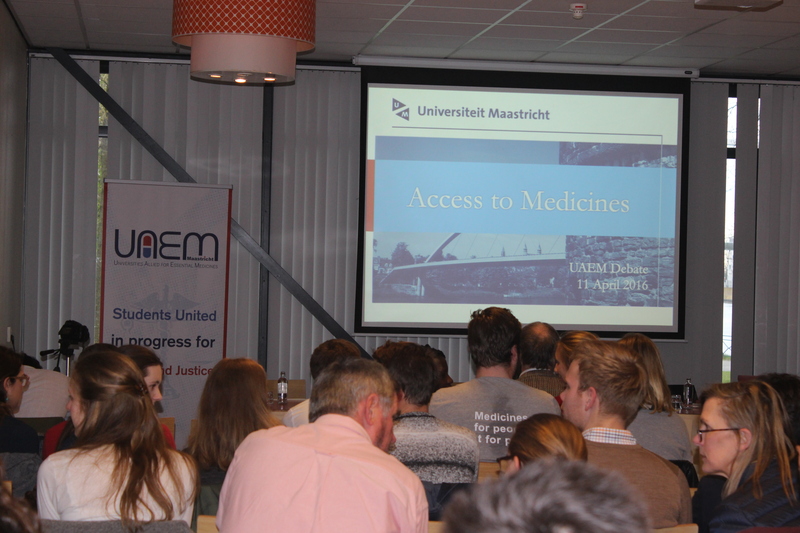 After weeks of preparation the 14th of November finally arrived: the start of Access to Medicine week 2016. A week full of events build around the central theme: antimicrobial resistance and the failing R&D system. Our university faculties and Facebook pages started turning yellow and the slogan: ‘let’s tackle the superbugs together’ could not be missed. Flyers were spread, posters were hung and the word started going round. 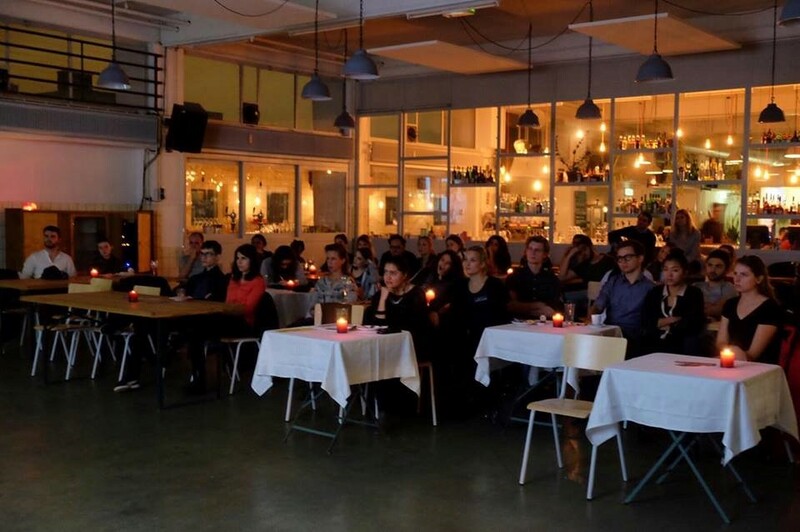 Video messages with questions like: “do you ever take an antibiotic for a cold or flu?” and “what if you are already resistance and can’t be cured anymore?” popped up on everybody’s news feed, making more and more people interested and eager to join the events we had organised for the week. 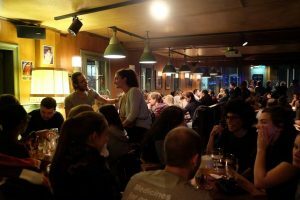 Only Monday evening we kicked off with a pub quiz at Peter’s Irish Pub. It was a full house. Although not all people attending were affiliated with UAEM, more than 100 people were present. And oh dear, our knowledge was put to test. Questions like “who are the female co-founders of Hogwarts” were alternated at high speeds with questions about antibiotic resistance. Whilst enjoying a beer, brains were cracked and knowledge was gained. After the winning team collected its prize, everybody left full new information about antimicrobial resistance and what he or she can do about this problem. After this night, questions that kept floating around in our brains needed answers. UAEM Maastricht partnered up with De Brandweer to shed light on some of the important mechanisms of AMR during the screening of the award winning documentary “Resistance.” One and a half hour of breathless watching, and intensely sipping on drinks and nibbling on snacks, later everyone was moved by the microscopic world of bacteria, the harrowing personal stories of people related to AMR and the seemingly dark future that is ahead of us. 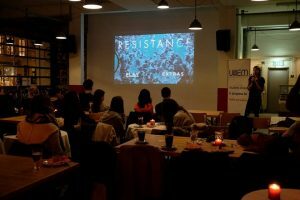 However the motivational flow to fight this future and tackle the problem started when Shelly Parry, a UAEM member who wrote her thesis about an AMR related topic, guided a discussion on the topic. How did we get to this point? What can we do to turn the tide? A discussion about new ways of creating antibiotics started and people requested more information which we sent them afterwards via mail. All of the audience left enlightened and motivated. 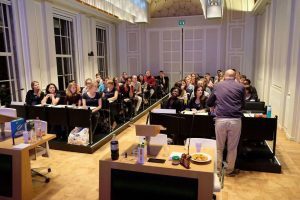 On Thursday night, we left the stage to the chair of the Dutch Malaria Foundation, author of a Ted-X talk and award winner of an Ig Nobel Prize and Eijman medal, Bart Knols, for a lecture on malaria and the resistance to its treatment. The world of malaria resistance opened up for the audience, which was shocked by the number of fake drugs being shipped in Africa every day. Afterwards more discussion under the enjoyment of some beers and pepernoten went on until the late hours. 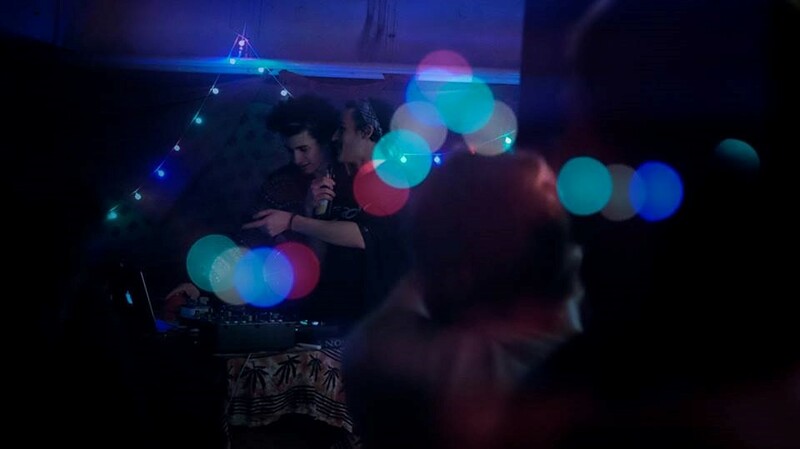 On Friday we closed off the week with a blast: Music for Medicines mesh up at the Mandril. A party at the Mandril Cultural and Political Centre featuring artists with colourful vibes in a magical space dancing on funky tunes. 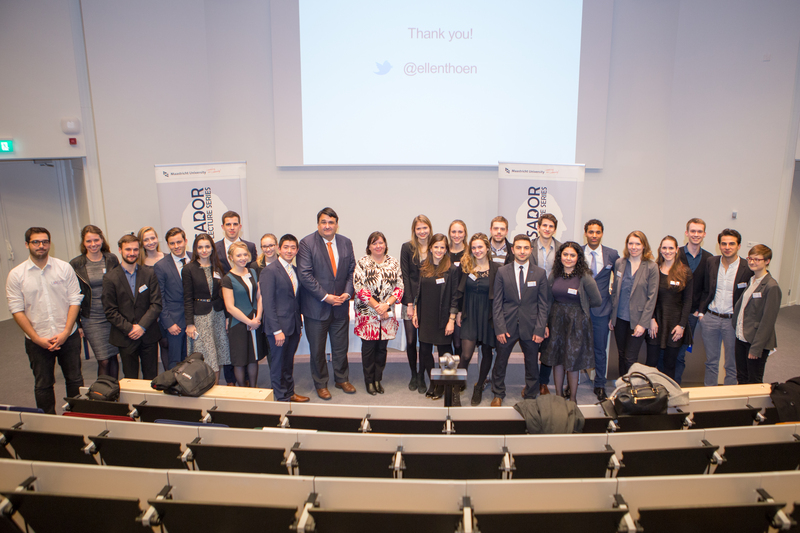 Eager and motivated to fight for our goals and fight AMR we look back on a very successful Access to Medicine Week. Throughout the week a lot of people got interested in UAEM, and we were humbled by the amount of people who would like to join our organisation. We will keep in close contact with them and invite everyone to our member recruitment in January 2017. Following the pictures: they say more than a 1000 words! Many thanks to everyone who helped organising this year’s Access to Medicine week and to everyone who attended our events! Let’s tackle these superbugs together and see you next year! 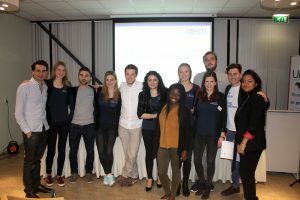 Every year UAEM Maastricht is proud to announce a new board, the group of people in charge of maintaining a helicopter view on the local UAEM chapter and ensuring a well-operating team that keeps in line with the goals and vision of UAEM. “Access to Medicine” is our line of action with many branches, with focus on the Research and Development system and making our university actively pursuing the goals drafted in Socially Responsible Licensing (SRL) policy. We introduce the new board that will pursue the projects established under the previous board and aim for new ambitious goals such as organizing a glowing access to medicine week in November, setting up an advisory board to monitor and advise on the implementations of signed SRL policy and recruiting new members from different studies and backgrounds to strengthen the manpower and creativity of the group. 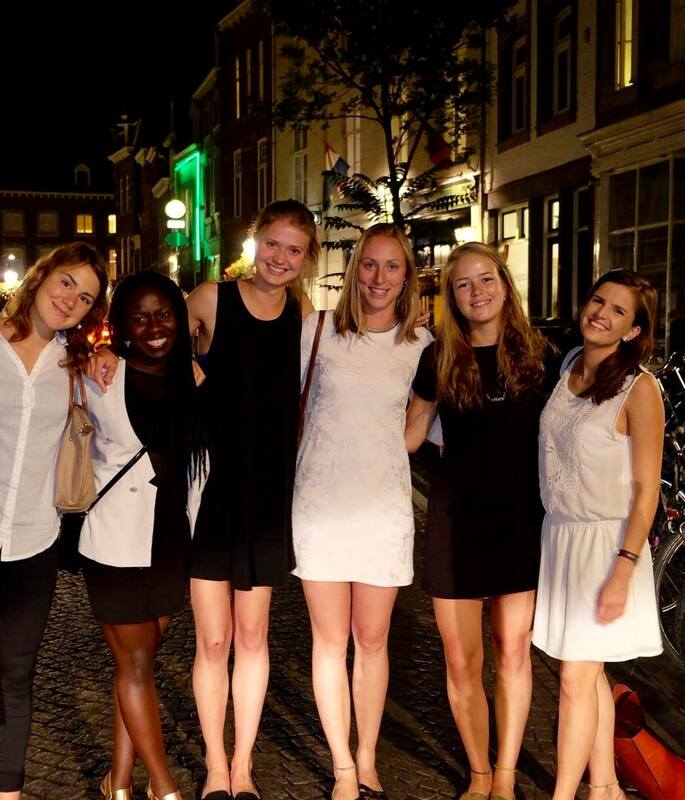 This year, UAEM Maastricht wants to focus on external and internal education. It will accomplish this by integrating UAEM related topics to the curriculum of different studies of the University, such as the Bachelor of Medicine, the Master of Global Health as well as the Business Bachelor. This will build a general awareness of these topics and allow the exchange of ideas about issues related to health policies, neglected tropical diseases and the economic market of medicines. 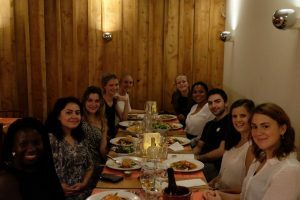 Furthermore, we are introducing the UAEM academy, an attempt to keep UAEM members up to date and sharp on several topics that are dealt with within UAEM as well as to become more informed about the UAEM pillars and policies. 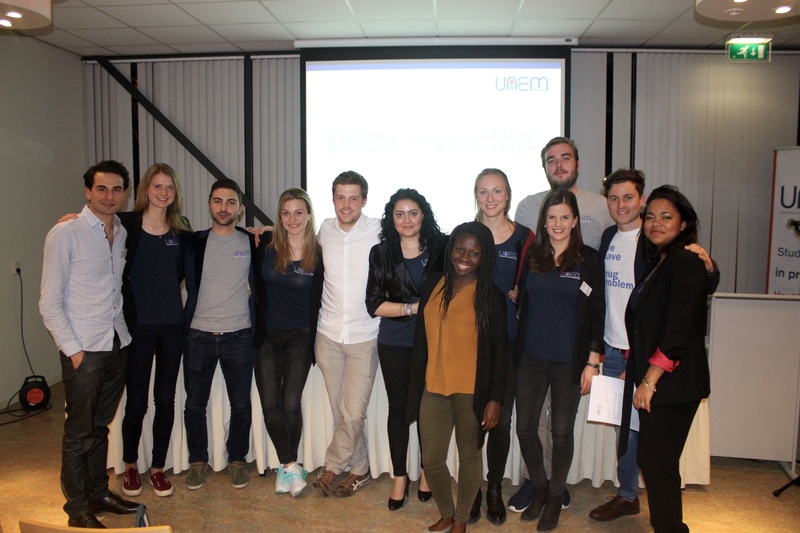 UAEM Maastricht owes all its members an applause for their motivation, creativity and innovation. Hoping to have a good year full of success, joy and development of a world with better access to medicines and awareness about health issues! What do you need to bring to the table to become a new UAEM member? 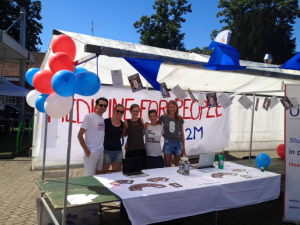 During this year’s information market for new students of the university, UAEM Maastricht had the opportunity to stand among other official student organisations and to promote its work. 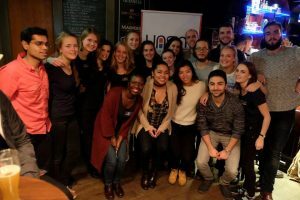 Many curious students rushed towards the colourful “Medicine for people” banner and expressed their gratitude for the noble actions taken by UAEM’s members to create a more equitable healthcare system. Many interesting conversations and new ideas were shared, e-mail addresses were written down, and subscriptions quickly broke records. 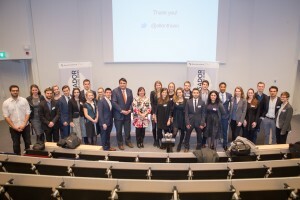 “About a third of the world’s population lacks access to essential medicines, and one of the main reasons for this is the current intellectual property regime.” Jennifer Sellin, lecturer and researcher at the department of International Law at Maastricht University unscrupulously addressed the elephant in the room, the subject of heated debates and conversations. The high prices od patented medicine and the issue of limited access to essential medicines was the subject of a debate bringing together the divergent perspectives and opinions of Cornelis Boersma, Director of Corporate Affairs at GlaxoSmithKline (GSK), Dr. Henri Theunissen, head of the Technology Transfer Office of Maastricht University, Eduardo Urias, PhD fellow at UNU-MERIT and Richard Slobbe, pharmacist and founder of the Global Initiative for Medication Safety. Cornelis Boersma stressed the importance of Corporate Social Responsibility (CSR): “We value shareholders and stakeholders [equally]”. He pointed out that GSK are active in developing vaccines for diseases which typically affect subtropical countries, and that HIV products have been made available through licensing. 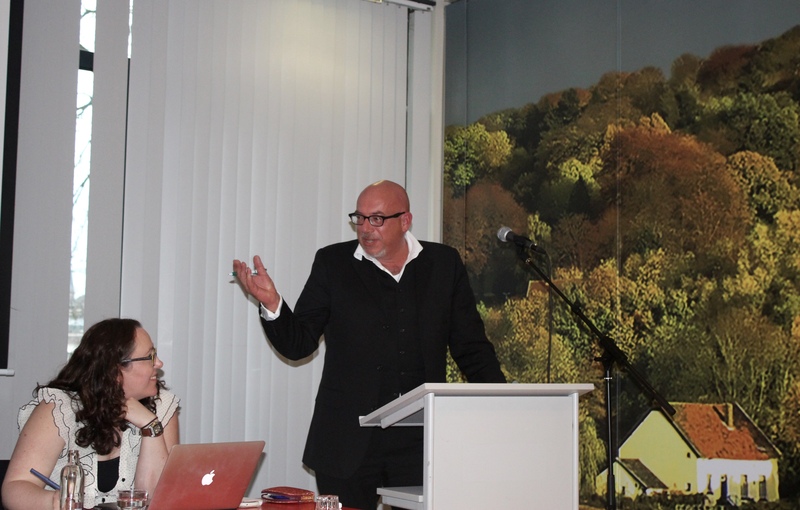 However, Richard Slobbe reminded the audience of the commercial interests of the pharmaceutical industry and expressed concern with the business model of the pharmaceutical industry and the structure of the market pharmaceutical companies compete in. He claimed that industry leaders attain considerable profit margins (GSK made £8.32bn in 2015, with a profit margin of 35%). 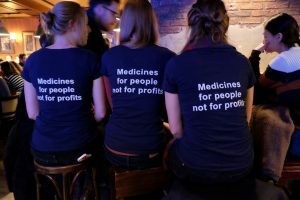 As an echo to this statement, Henri Theunissen, avid supporter of UAEM, added that the issue at stake does not solely reside in the patents regime but is also a matter of drug pricing. Solutions can therefore only be found through an open dialogue between governments and the pharmaceutical industry. The debate thus followed a familiar pattern whereby the defenders of the status quo identify the interaction of major actors (companies, governments, trade organisations) as providing the potential for a solution, and critics emphasise the structural and institutional problems (markets, patent laws) as targets for change. What is certain is that the current situation is getting more attention, especially considering the fact it has become a matter of concern even in high incomes countries. Indeed, Eduardo Urias mentioned the example of the UK National Health Service’s withdrawal of 25 cancer drugs. Furthermore, with the recent signing of the Transatlantic Trade and Partnership Agreement, extending the monopoly of pharmaceutical companies in agreeing member states, it seems clear that lobbyists often set tone on the agenda of state governments, as pointed out by Sellin. The panellists were able to agree on one statement however: providing healthcare to all will require global (transnational and supranational) and societal action. Whether this will be attained with radical approaches like the nationalisation of pharmaceutical industry or by resorting to Social License to Operate will certainly be the subject of future discussions. 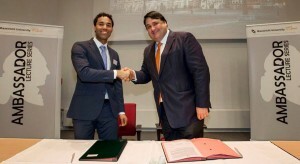 Maastricht University is the first University of the Netherlands in signing the Socially Responsible Research and Licensing (SRRL) policy. 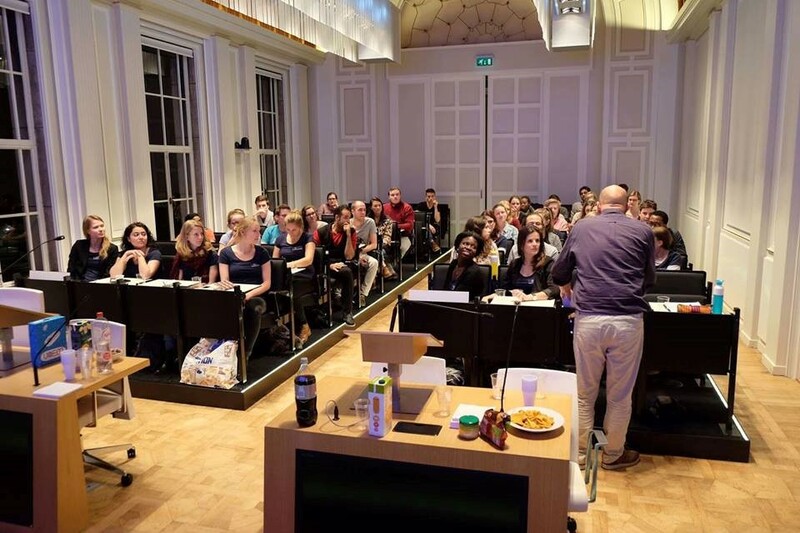 On the 8th of December 2015, Prof. Dr. Martin Paul, president of Maastricht University, signed the agreement in the course of a big event organized by UAEM Maastricht and the Ambassador lecture series. About 200 people joined us for this event. 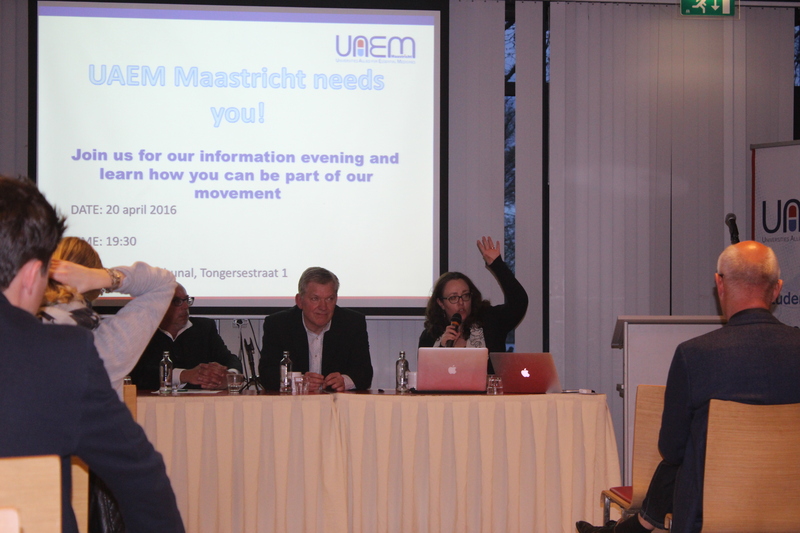 One of our highlights was the speech by Ellen ‘t Hoen, an expert in medicine policy and intellectual property rights, and a big UAEM supporter. 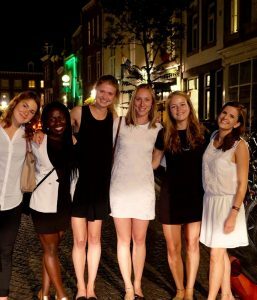 As Jeffrie, the co-founder of UAEM Maastricht, mentioned in his speech, “this was not an act of generosity, but a compelling necessity”, because the decision of our university is based on moral justice. By signing this policy Maastricht University agrees on making research more transparent, improving research on neglected diseases, and trying to integrate the topics into the curriculum of the university. 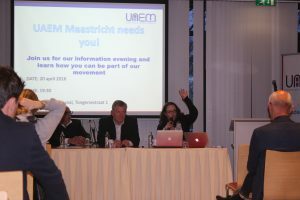 This was a really important day for us as UAEM Maastricht, but also a milestone for UAEM Netherlands, and UAEM Europe. Still, our mission is not done with the signing of this contract. This is just the beginning of the implementation of the policy in Maastricht and a long way of fighting for more access to medicine. We hope that more universities in Europe will follow!